Children's Songs for Banjo is designed to be playable by beginning and novice musicians. 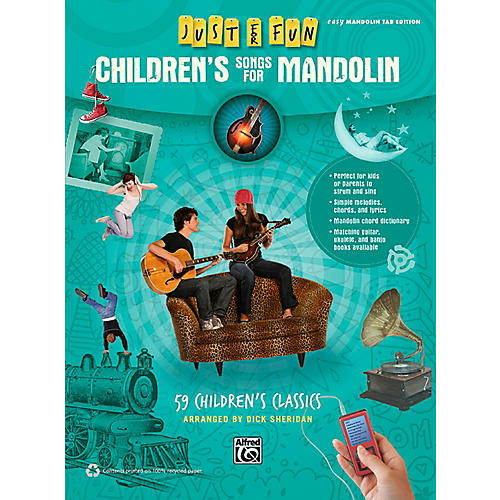 It's perfect for children, and for parents who want to strum and sing these great songs along with their kids. Plus, matching guitar, ukulele, and mandolin books are available---just for fun! Titles: A-B-C * A-Hunting We Will Go * All the Pretty Little Horses * All Through the Night * The Alphabet Song * Angels Watching Over Me * The Animal Fair * Baa, Baa, Blacksheep * The Bear Climbed Over the Mountain * Bill Hogan's Goat * Billy Boy * Bingo * Blue Jay Pulled the Four-Horse Plow * Bobby Shafto * Brahms' Lullaby * Come Little Leaves * Did You Ever See a Lassie? * Do Your Ears Hang Low? * The Farmer in the Dell * Father's Whiskers * Found a Peanut * Frere Jacques * Go In and Out the Window * Goodbye, My Lover, Goodbye * Goodnight, Ladies * Here We Go 'Round the Mulberry Bush * Hickory Dickory Dock * Hush, Little Baby * I Have a Little Dreidel * If You're Happy (And You Know It) * It's Raining, It's Pouring * Itsy Bitsy Spider * Jesus Loves Me * John Brown's Baby * Limericks * London Bridge Is Falling Down * Mary Had a Little Lamb * Michael Finnegan * Mighty Lak' a Rose * Mr. Frog Went A-Courting * The Muffin Man * My Bonnie Lies Over the Ocean * Ninety-Nine Bottles of Beer * On the Bridge of Avignon * Polly Wolly Doodle * Pop! Goes the Weasel * Raisins and Almonds * Rig-a-Jig-Jig * Ring Around the Rosie * Rock-a-Bye-Baby * Row, Row, Row, Your Boat * Sailing, Sailing * She'll Be Coming 'Round the Mountain * Sing a Song of Sixpence * Skip to My Lou * This Old Man * Three Blind Mice * Twinkle, Twinkle, Little Star.